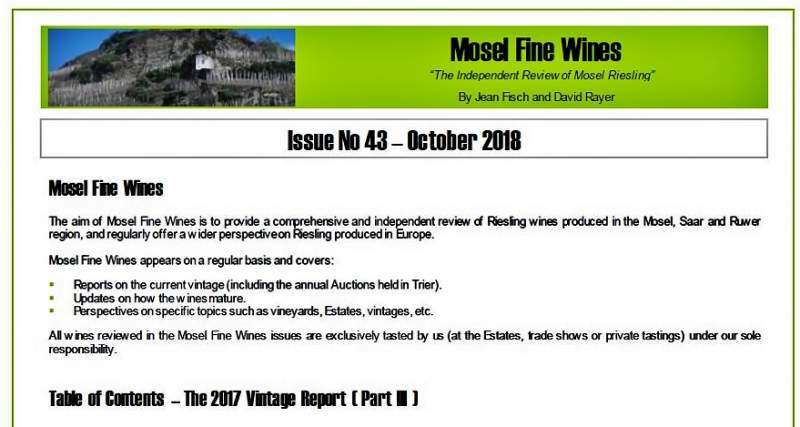 Mosel Fine Wines | Issue No 43 (Oct 2018) is out! This 130-page strong Issue includes Part III of our extensive 2017 Vintage Report with 500 wines tasted from the Mosel and the whole of Germany. After a brilliantly vibrant 2015 and a gorgeously sensual 2016, can the Mosel hit the bull’s eye three times in a row? It seems so, despite (or thanks to) the fact that 2017 was hit by some devastating yield-reducing frost. The finest of the 2017 wines are simply amazing ... and there is perfection at the top! We provide an overview on what is set to become a remarkable vintage. 2017 Mosel Vintage Report Part III | 430 Recommended Wines from 50 Estates! Part III of the Vintage Report includes 15 detailed Estate Reviews (with over 250 wines sampled). It also provides detailed tasting notes for another 180 recommended wines from a further 35 Estates, including from some new names we bet you have never heard off as well as most high-end dry Riesling (GG & equivalent). The annual Trier Auctions saw the sale of some of the finest 2017 Mosel Riesling. We look back at the two events which yielded record high prices as well as some stunning bargains, and complement this with some additional tasting notes. 2017 proved a vintage rooted in intensity and zest for German Riesling. These conditions were not easy to master and resulted in great as well as rather average dry Riesling. We highlight over 50 recommended dry Riesling from outside of the Mosel as well as 80 stunning dry Riesling highlights from the Mosel. “Where can I access mature Riesling?” As an answer to this regular question from our readers, we provide here detailed tasting notes for 6 superb mature Riesling still commercially available at the Estates including a perfect wine which has just been released. Secure your copy of Mosel Fine Wines Issue No 43 (Oct 2018)! This Issue No 43 is being sent out as we post these lines and all subscribers should have received their copy by this evening.